Bringing home a new amputee dog or cat from the hospital is like bringing home a newborn infant. You may feel uncertain and scared, but your parenting instincts will kick in before long. 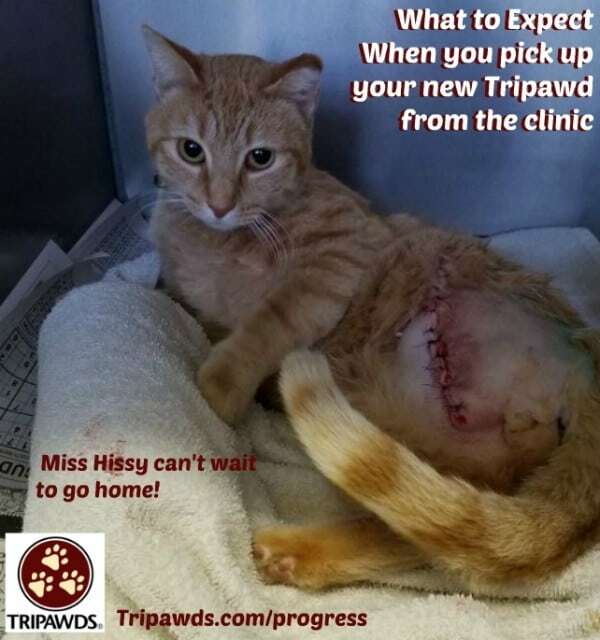 If your pet has just had surgery, here’s what to expect when you pickup your Tripawd from the clinic. As you start feeling the weight of your decision to proceed with amputation surgery, accept that there will likely be challenges over the next few weeks. You may be sad, or even regret that you went through with the surgery, but that’s normal. Don’t beat yourself up, remember to be strong, and know that the recovery time is just a temporary price to pay for more quality time together. Get your mindset in the right place before you head to the clinic. It’s a relief to know that immediately after your dog or cat’s amputation surgery, the pain your pet was in will be gone. It’s a bittersweet feeling to know that your pet is alive and well, but that your life together will be very different. Try to put those feelings and worries aside for now, and celebrate that your Tripawd is headed home! The best way to get your head together is to visit the Tripawds Start Here page and read Jerry’s Required Reading List. You’ll find answers to many of your questions. You usually can’t pick up your Tripawd from the clinic until he or she can walk a few steps, eat something and potty without help. When you arrive at the hospital your dog or cat may look tired and a bit confused, but please don’t mistake that for depression or anger towards you. Remember your pet has had major surgery and is probably still dopey from pain medication. That is perfectly normal. The amputation incision surgery site will be shocking. Prepare for it by viewing our Tripawds Photos and Tripawds Video Galleries ahead of pick up day. Step 3: Celebrate the Tripawd Hop! You’ll notice that your pet’s walk has changed to a faster clip that’s more of a hop. Please don’t feel sorry or think of your pet as now being “disabled.” Their unique gait is a sign that they are out of pain, feeling good and hoppy to be alive! Front legged Tripawds instinctively shift the weight of their remaining front limb into the middle of their chest, which is where the nickname “tripod” comes from. They tend to have a pogo-type hop, because in order to propel themselves forward on one leg while keeping their balance, they need to throw their weight up into the air and land their front leg right in the middle. Rear leg Tripawds also walk a little faster than usual, and have different stance and gait challenges depending on their body type. Tripawds with naturally angulated, low slung rear ends like German Shepherds tend to dip down even lower when walking, and may also take longer to build up strength than other breeds with more table-like body structures. Your Tripawd hero is now ready to come home to your Tripawd-proofed home with traction on slippery surfaces and a quiet, confined area for rest. Koa gets an incision check after amputation surgery. Amputation surgery recovery isn’t a picnic, but it’s not always difficult either. Most pets handle it better than any human. Scour the Tripawds blogs and Treatment and Recovery Forum for post-amputation experiences that are both good and not so good. 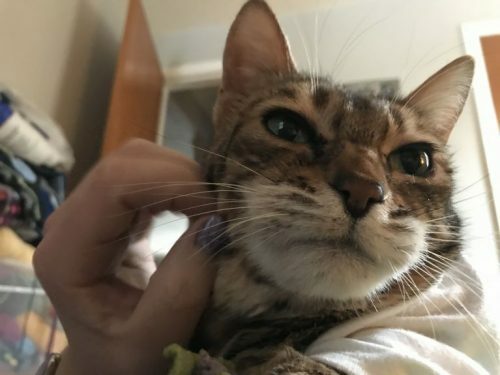 For example, you’ll see that Tibby had a typical amputation recovery journey for a cat, which you can read about it Tibby’s Road to Recovery. Of course not all recoveries go according to plan. Sometimes despite your best efforts, things can get tough. 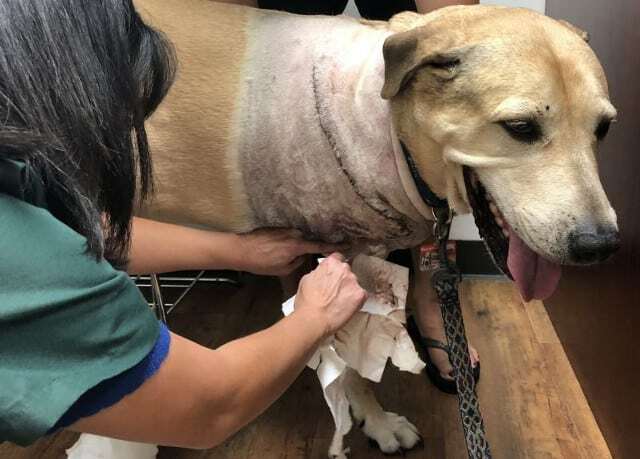 Sketch had a post-amputation infection that turned into a long MRSA fight for his life. He survived, thankfully! The best way to prepare for the day you pick up your Tripawd from the clinic is to take your list of amputation questions for your vet. Get answers, jot them down in your Tripawd journal so you have something to refer back to once you arrive home. Pandora is happy to be free from the hospital! All Tripawds have a different recovery timeline, but most take anywhere from three to six weeks for a healthy recovery. That doesn’t mean your pet will be 100 percent back to their usual activities again, but they will be strong enough to enjoy short, sweet walks and quality play time with you once again. Remember, be patient during this time. Focus on your pet’s joy at seeing you again. Smile and present strong, positive energy. We guarantee your Tripawd will fell empowered by it. Your Pet Can Star in a Tripawd Tuesday Tale!